The Maine Legislature is working on the next two-year state budget and considering legislation directly impacting you and the quality services Maine people count on. It’s up to all of us to alert our state senators and state representatives to issues like understaffing, so please reach out to them. Use our 2019 Guide to Contacting Your State Legislators to advocate on the issues below. The legislative session will continue into June. Ask your state senator and state representative to pass a state budget that adequately funds and staffs the quality public services Mainers count on. Tell them the Governor’s budget is a starting point; they have a responsibility to ensure services such as public health nursing, 911 dispatching, child and adult services, and highway maintenance are responsibly staffed and funded. Ask them to make sure public workers have the resources needed to do their jobs. The State of Maine’s wage compensation system for Executive Branch employees has never been updated in a comprehensive, meaningful way since its implementation in the 1970s. It needs to be brought into the 21st century, in line with market wages, in order for the State of Maine to recruit and retain qualified employees. We are supporting legislation titled Resolve, To Conduct a Comprehensive Study of the Compensation System for State Employees. Introduced by Senate President Troy Jackson and currently known as LR 1585, this legislation would authorize and fund a comprehensive study of the State of Maine’s Executive Branch compensation system. The study would examine pay scales, ranges and job classifications to ensure the State remains competitive with other employers and to ensure workers are compensated for the work they are actually doing rather than what’s merely listed in their job descriptions. We expect the study would take a year to complete. Once completed, the study would become the subject of collective bargaining in the Executive Branch. TAKE ACTION: Help build awareness and support for a Compensation Study by registering for Labor Lobby Day on Thursday, March 14, at the State House. Together, let’s tell the Legislature in order to recruit and retain qualified workers, the State of Maine needs a 21st century compensation system. In recent years, some state contracts have led to services going unfilled, while others have wasted taxpayer dollars. A system of checks and balances is needed to determine whether to state services should be privatized or contracted out, and to determine whether all the requirements of bidding and privatization contracts have been met. Legislation known as An Act to Protect Taxpayers in the Privatization of State Services, sponsored by Senator Shenna Bellows, provides the necessary checks and balances. This legislation, which didn’t yet have an LD number at press time, establishes a process before a state agency can enter into a privatization contract. We support LD 644, An Act to Improve Safety at State Courthouses, sponsored by Representative Donna Doore. A hearing before the Judiciary Committee takes place at 1 p.m. Feb. 28 in State House Room 438. We support LD 428, An Act to Establish Wage and Employment Parity Between Adult and Child Protective Services Caseworkers in the Department of Health and Human Services, sponsored by Representative Lois Galgay Reckitt. A hearing before the Health and Human Services Committee is set for 12 p.m. Feb. 27 at Cross Office Building Room 209. 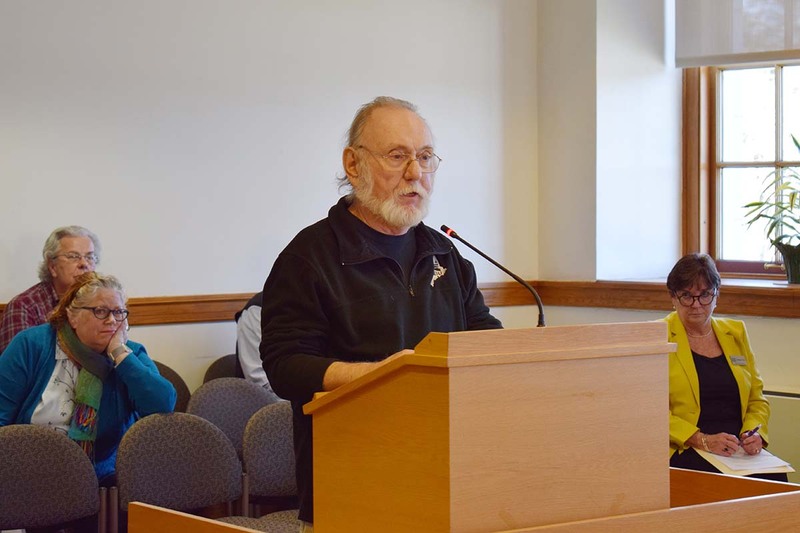 MSEA-SEIU retiree members, state legislators and others testified Feb. 6 before the Legislature’s Taxation Committee in support of LD 162, “An Act to Eliminate the State Income Tax on Maine Public Employees Retirement System Pensions,” sponsored by State Senator Shenna Bellows. MSEA-SEIU Retiree Member Jim Betts said he and his wife are both impacted by the state tax on public employee pensions. Previous legislatures, he said, exempted Social Security benefits from state income tax, yet continued taxing the pensions of state employees even as they enacted tax cuts heavily weighted in favor of those with higher incomes. Adding to the injury to Maine’s public employees and retired public employees are the harmful Social Security Offsets, which penalize Maine’s public employees by reducing or eliminating Social Security benefits they may have earned, the retiree members and legislators told the committee. Also testifying in support of LD 162 were the bill’s sponsor, State Senator Shenna Bellows, and State Rep. and MSEA-SEIU Retiree Member Donna Doore. The State’s chronic staffing problem is impacting MDOT camps statewide. Staffing shortages can result in unsafe conditions for you and the people you serve. These shortages also can make it more difficult for workers to get training and certifications. Legislation known as An Act to Address the Shortage of Snowplow Drivers, sponsored by State Senator David Miramant, provides a solution: wage increases of $2 per hour for the following positions: Transportation Worker I; Transportation Crew Supervisor; Transportation Worker II; Transportation Operations Manager; Transportation Worker III; Heavy Vehicle & Equipment Tech; Highway Laborer; Field Heavy Vehicle/Equip Tech; Transportation Crew Technician; Welder/Fabricator; and Transportation Crew Leader. The Governor’s proposed budget includes the creation of a prerelease center in Washington County. This proposed facility comes a year after the closure of Downeast Correctional Facility in Bucks Harbor. Please ask your legislators to support the establishment of this prerelease center. While many of our members have paid sick leave in their collective bargaining agreements, some MSEA-SEIU members as well as many private sector workers in Maine don’t have any access to paid sick leave. We believe all workers should have access to paid sick leave. That is why we support LD 369 is “An Act to Support Healthy Workplaces and Healthy Families by Providing Earned Paid Sick Leave to Certain Employees,” sponsored by State Senator Rebecca Millett. A hearing before the Labor and Housing Committee is set for 11 a.m. Feb. 25 in Cross Office Building Room 202. We persuaded legislators to reject LePage’s proposed two-year freeze on the retiree cost of living adjustment (COLA). The resulting COLA increases are helping both current and future retirees because every COLA increase is added to the pension base. In addition, thanks to your advocacy, a bipartisan, supermajority of state legislators on Aug. 2 overrode the Governor’s veto of the public health nursing legislation, LD 1108, and put it into public law. The law requires the filling of all public health nursing positions, including vacancies, funded in the budget. The law also provides policy direction. The budget protects the wages of everyone locked out of their jobs or ordered to work during the shutdown. We made sure legislators included budgetary language making everyone whole. The budget rejected the Governor’s proposal to eliminate the Homestead exemption for most families, as originally proposed in the administration’s budget. The budget secures $14.25 million in additional funding for the direct care workforce serving seniors and Mainers with disabilities. The budget funds the Maine Community College Systems Strategic Workforce Initiative at $10 million, designed to give Mainers the skills and training necessary for immediate employment. The budget gives more young Mainers an opportunity to thrive as children and later as productive adults. The budget doubles the number of hours for Mainers who can receive services for people with intellectual or developmental disabilities under the Section 29 waiver. The budget rejects proposed cuts to reimbursement rates for Critical Access Hospitals that serve most of Maine’s uninsured throughout the state. This ensures that Critical Access Hospitals will continue to be reimbursed at a higher rate for the work they do and the people they serve. Also, the Legislature carried over the bipartisan student debt relief bond initiative known as LD 1163 to the next legislative session. Thanks go to the MSEA Rising members and all other MSEA-SEIU members who took action and will continue to take action in support of LD 1163. 2.55 percent cost of living adjustments to pensions of eligible retired state workers and teachers in September 2015 and again in September 2016. Emergency legislation providing wage adjustments to Riverview/Dorothea Dix workers. Legislation providing wage adjustments for supervisors of law enforcement and other law-enforcement personnel. The bipartisan state budget compromise of 2015 providing $2 million for raises for home care workers. Other legislation funded another $250,000 over the next two years for raises for personal care attendants. In addition, during the 127th Maine Legislature, we built the political support necessary to pass legislation improving the safety of the Maine State Ferry Service. We secured the political support necessary to pass legislation funding our tentative contractual agreements throughout state government. We built the political support necessary to defeat anti-worker proposals pushed by the Governor. Outside of the 127th Maine Legislature, in the summer of 2016, we worked with current and former legislative allies, among others, and helped persuade the administration to reverse its announced closure of the Maine DHHS office in Fort Kent. Below is a detailed summary of the legislative gains mentioned above. LD 86, “An Act To Improve Retirement Security for Retired Public Employees,” became law July 12, 2015, without the Governor’s signature. This law provided eligible retired state workers and teachers cost of living adjustments (COLAs) of 2.55 percent added to their base pensions in September 2015 and again in September 2016. Total value to all eligible retired state workers and teachers is about $14 million per year. Current state workers and teachers who participate in the retirement system benefit from LD 86; it raises the maximum pension base for COLA-calculation purposes. Prior to the passage of LD 86, the current maximum pension base for COLA-calculation purposes was $20,420. The 2.55 percent COLA that took effect in September 2015 increased the maximum pension base for COLA-calculation purposes to $20,940. The 2.55 percent COLA taking effect in September 2016 increased the pension base again, this time to $21,474 for COLA-calculation purposes. LD 1645, “An Act to Improve Employee Recruitment and Retention at the State Mental Health Institutions,” sponsored by Senator Katz, was enacted unanimously in the Senate and 109-40 in the House. The Governor vetoed the bill. On April 29, 2016, at our urging, and with direct lobbying by our members and legislative sponsors, the Senate overrode the veto 34-1 and the House overrode 116-25. The emergency legislation took effect July 1, 2016. LD 1523, “Resolve, to Provide Wage Parity for Law Enforcement Supervisors,” sponsored by Senator Davis, originally was passed to provide a 5 percent wage adjustment to all the supervisory law enforcement officers MSEA-SEIU represents. The Appropriations Committee, with a unanimous vote, amended LD 1523 to include the Governor’s law enforcement wage bill (LD 1653). LD 1653 proposed increasing wages for certain state law enforcement officers from 12 to 18 percent. LD 1523 had previously received a unanimous vote of support in the Senate and a 142-2 vote in the House. LD 1523 will be paid for out of salary savings. All MSEA-SEIU law enforcement supervisors receive a wage adjustment ranging from 5 to 18 percent. The bipartisan state budget compromise of 2015 added $2 million for raises for home care workers, increased funding for the Maine Community College System by $6 million and allowed new retirees to buy back income lost to merit and longevity pay freezes in fiscal years 2012 and 2013. In addition, LD 1350, “Resolve, to Increase the Reimbursement Rate for Direct-Care Workers Serving Adults with Long-Term Care Needs,” sponsored by Maine House Speaker Mark Eves, funded an additional $250,000 over the next two years for wage increases for personal care attendants. This is over and above the funding in the bipartisan state budget compromise. LD 1468, “Resolve, To Improve the Safety of Ferries in State,” sponsored by Senator Miramant, was enacted in both houses and vetoed by the Governor. At our urging, and with lobbying by our members and the legislative sponsors, the Senate overrode the veto April 29. The vote was 35-0 in the Senate and 113-32 in the House. The bill is law. LDs 1663 and 1664, both submitted by the Governor, attempted to make changes to the State’s civil service system. LD 1663, “An Act to Promote Employee Recruitment and Retention,” would have changed the current merit pay system from merit pay awarded based on standards of performance to one requiring meritorious performance that exceeds satisfactory performance. It also would have implemented a recruitment bonus. LD 1663 was voted out of the State and Local Government Committee with a majority ought not to pass (7-6) recommendation. LD 1663 then passed in the Senate but failed in the House, which means it died between the chambers. LD 1664, “An Act to Enable the State to Hire Qualified Applicants,” was voted out of same committee with a majority ought not to pass (7-6) recommendation and died in non-concurrence between the chambers. LD 1664 would have altered the current practice of applicants qualifying based on a combination of experience and education. We supported, as amended, the Governor’s LD 1668, “An Act to Facilitate Internal Hiring by Reforming the Use of Registers in Civil Service Rules,” which eliminated outdated language relating to registers. It also allows the HR director to extend one-year temporary positions based on unusual circumstances. This bill passed out of committee with a unanimous ought to pass recommendation, was enacted into law by the Legislature and signed into law by the Governor. LD 1668 is now law. EXECUTIVE BRANCH: In September 2015, MSEA-SEIU members in the Executive Branch’s Administrative, Professional-Technical and Supervisory Services bargaining units ratified their tentative contractual agreements. Because the contracts were ratified prior to the Sept. 29, 2015, deadline listed in the legislation funding tentative agreements, state workers in those three bargaining units secured the union-negotiated, across-the-board wage increases of 1 percent effective October 2015 and another 1 percent effective July 2016. In addition, hours before the Maine Legislature adjourned April 29, 2016, for the year, state legislators at our urging approved the emergency legislation known as LD 1702, “An Act to Fund Agreements with Bargaining Units for Certain Executive Branch employees,” sponsored by Senator Cushing. LD 1702 funded the tentative agreement in the State of Maine Executive Branch Operations, Maintenance and Support Services (OM&S) Bargaining Unit so long as it was ratified by May 31, 2016. Our members ratified it by that date. JUDICIAL BRANCH: In 2015, MSEA-SEIU members in all four of our Judicial Branch bargaining units — Administrative, Law Enforcement, Professional and Supervisory) — ratified two-year successor contracts. The four contracts, good through June 30, 2017, provide pay raises as follows: 1 percent starting the first pay period after Sept. 1, 2015; another 1 percent starting the first pay period after July 1, 2016; adding a step and dropping a step starting April 2016; employees whose hire date is on or before June 30, 2011, and who have uninterrupted Judicial Branch service, will receive an additional step increase at the start of the pay period closest to January 2017; the longevity pay freeze was removed; and mentor pay was established at an additional $1 per hour. LEGISLATIVE BRANCH: Also in 2015, MSEA-SEIU members in our Administrative Unit of Legislative Employees within the Legislative Branch unanimously ratified a two-year contract running from Oct. 1, 2015, through Sept. 30, 2017. The contract includes a two-and-a-half percent wage increase during the first year of the contract, and a one-and-a-half-percent wage increase during the second year. Eligibility to advance to the last two steps now includes previous relevant experience. Part-time employees become step-eligible after passing probation and completing one year of service. The contract also improves vacation-leave language and restores compensating time for pay grades seven through 12.